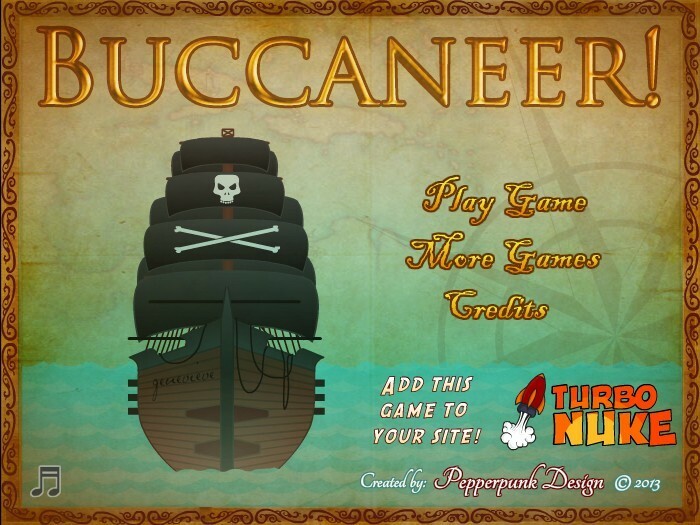 RPG Fantasy Upgrade Watercraft Turbo Nuke Click to find more games like this. Cheat: Keyhack 1 toggle health, 2 toggle instant reload, 3 add ammo, 4 add doubloons, 5 add time (weeks). 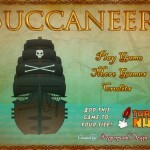 Keyhack 1 toggle health, 2 toggle instant reload, 3 add ammo, 4 add doubloons, 5 add time (weeks). 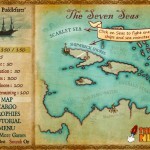 Battle mighty sea monsters, hunt for treasure and sack cities in this epic pirate adventure! You are on the run from the evil Lord Haddock, and it is only a matter of time before he catches you! 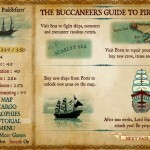 Use the time to sail the seven seas, building up a powerful crew, arsenal and ship by exploring seas and ports, completing quests and finding treasure maps and chests. Buccaneer! has 16 different areas to adventure in, 16 different enemies, and 4 different alternate endings, each with their own unique boss fight and quest path to unlock. 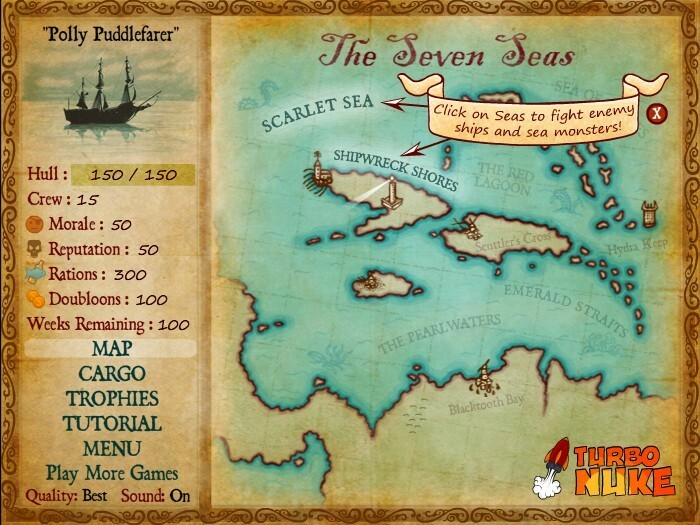 Will you slay the mighty Kraken, find the lost city of El Dorado, or drink from the mythical Fountain of Youth? 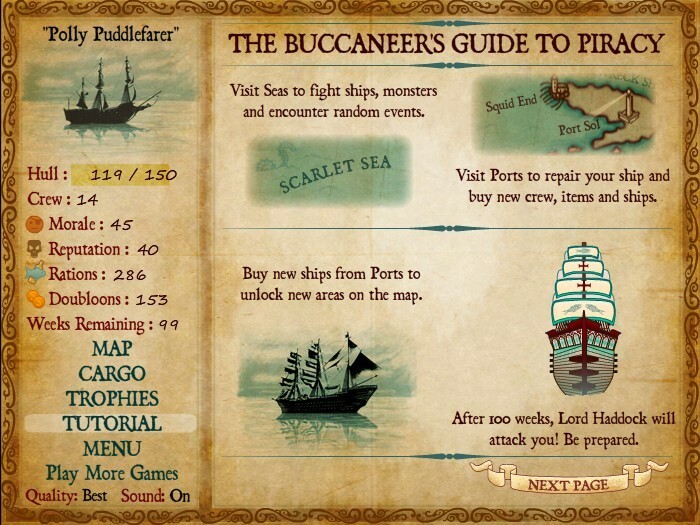 Click on ports and seas to adventure (each adventure takes 1 week, after 100 weeks Lord Haddock will attack). 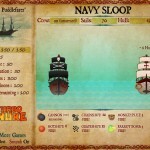 - Hotshot sets fire to enemy ships. 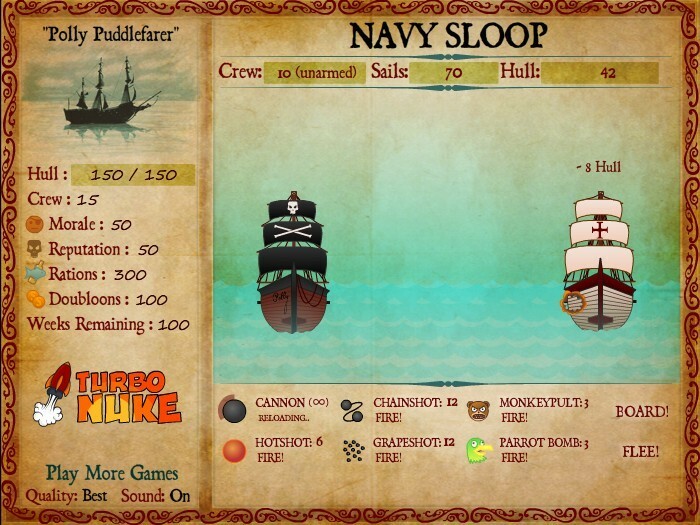 - Grapeshot does extra damage to sea monsters and kills enemy crew. - Chainshot damages sails on ships and entangles sea monsters. Watch out for the special attacks from sea monsters, which can freeze your ship, kill your crew or regenerate their own health.